In small claims courts, you get your disputes resolved in less time and with less expense than in regular court cases. You have no jury and usually no lawyers; in fact, in states such as Michigan, you may not bring a lawyer into small claims court. Your clerk of court or court record's office provides the forms you'll need. Hearings are informal and, according to the American Bar Association, run no longer than an hour. The caps on what you can seek and recover in small claims court vary by state. For example, Virginia limits you to $5,000, while you can ask for up to $10,000 in North Carolina. The ceiling in California depends on whether you sue an individual or business and the nature of your claim. If you're owed more than the limit, you can still go to small claims court, but your recovery is capped and you cannot sue later for the difference. States such as California require that you ask the defendant to pay you before you can go to court. Generally, small claims is the place to go if you're trying to evict a tenant, but not if you're claiming ownership or title to land. In the complaint, tell the defendants why you're suing and what you want from the court. The American Bar Association says to keep your statements short and to the point. Include the date and location of the motor vehicle accident, if that's your claim. On a breach of contract, identify what promises were broken and what you spent or lost as a result. You can typically get forms, which vary by state, from your local clerk of court's office or online. For example, in New York City, the forms as you to check under "primary reason for claim" the box for your claim. The Massachusetts small claims form doesn't have boxes to check but gives you space to state your claim. Use the full name, not initials, of the person you're suing. If your defendant is a business, search your state's business or corporations office database -- usually the secretary of state -- to find out if it's incorporated. If so, name the corporation and use the address for the "registered" office or "registered agent." For a business not run by a corporation, consult your state or local business license office to get the owner's name. You'll name as the defendant the owner "doing business as" or "d/b/a" the name of the business. State rules differ as to where you can sue a defendant. Generally, you must go to the county where the defendant lives; if the defendant is a business, go to the county where it has its main or home office. When you're suing more than one defendant, the county where any defendant resides will suffice. You'll need to have the complaint and summons delivered to the defendant. Depending on your state, a deputy sheriff will serve these items or you can send them by certified mail. 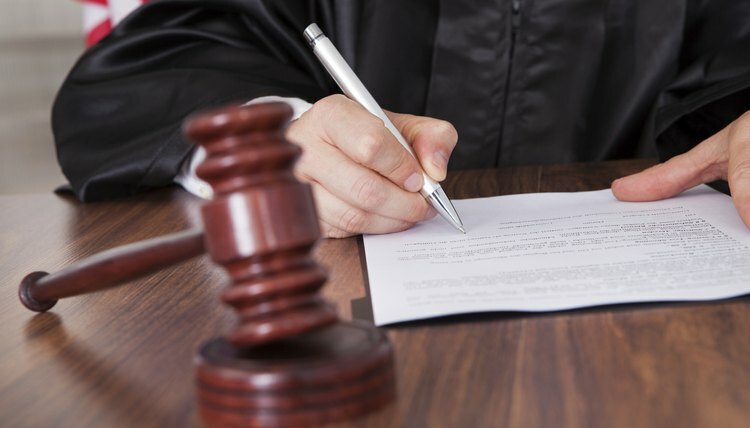 Typically, if the defendant doesn't get notice before the hearing date, the small claims judge will postpone the hearing to get the defendant served. Your witnesses can be those who saw or otherwise have firsthand knowledge of the events in your lawsuit. You can also bring expert witnesses -- for instance, a contractor who will give an opinion that the contractor you're suing performed substandard work. The American Bar Association advises, though, that you normally won't need one for small claims court and the cost of one might eat much of what you'll recover. You'll need to have your witness come to court to tell the judge what she saw and knows. Legal Aid of North Carolina says that you can subpoena, or have a court require, a witness to appear and testify -- especially if the witness won't come voluntarily or can't leave work. According to the American Bar Association, not all contracts have to be written, but oral ones are typically more difficult to prove in court. Legal Aid of North Carolina: A Guide to Small Claims Court -- Chapter 1 -- What is Small Claims Court? Raines, Christopher. "How to Sue Someone in Small Claims Court." , https://legalbeagle.com/4814725-sue-someone-small-claims-court.html. Accessed 22 April 2019.